My DIR-626L is working just fine. 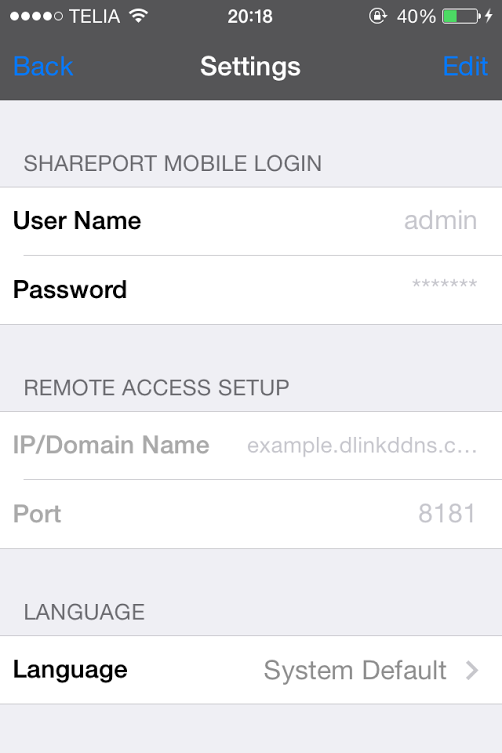 But ... in the Shareport Mobile App's Settings the Remote Access Setup section is greyed out, so I can´t enter my dlinkddns ip adress .. doesn´t matter if I´m connected to the router's wifi or on 3G. Everything works .. on the computer and in the app ..
except that I can´t edit the Remote Access Settings in the Shareport Mobile App. AH, understand, thought it was the storage section on the routers web page. My bad. Be sure the log in info is correct. Can you make any chanced when you select on "Edit"? I would phone contact your regional D-Link support office and inquire about this. Login is correct, works both the admin account and a read-account, and I can access my files using both when connected to wifi. Selecting edit just gives me the option to change Login & Language. And the problem is the same on both my iPhone 4S and my iPad Mini. Do you use the app? If so can you edit the Remote Access Setup?? I haven't used it in a while however opening mine up now and looking at it, I see that I had some values entered for Remote Access. Selecting the Edit, I can modify each option in the list you have displayed including the Remote Access Setup on my iPhone 4S. The router settings are needed however just to edit the SP app on the mobile device shouldn't be dependent upon the router settings to be enabled...only when the SP app goes to connect do the router settings need to be enabled and setup. and you are running iOS7, like me? I would try this, remove the app from the phone then do a re-install of it. See if you can Edit the information and go from there.